In a confusing decision, a German judge ruled that F1's King Wizard Nymph Bernie Ecclestone did indeed bribe a banker to the tune of $45 million for the sale of broadcasting rights. However, the judge ruled that it was all fine and dandy. 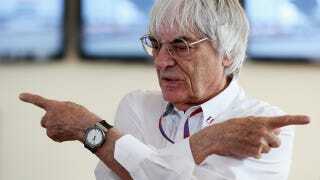 The reason why Ecclestone is getting away with bribery is because of the particularities of this case. The lawsuit actually comes from German media company Constantin Medien, which alleged that Ecclestone bribed another German businessman (Gerhard Gribkowsky) some $45 million to buy the rights to F1 for less than market value. This would mean that Constantin Medien lost a potentially more valuable sale of F1. In this case, the judge ruled that yes, Ecclestone did bribe this guy (the judge's exact words were "the payments were a bribe. "), but the sale wasn't below market value. That means that Constantin Medien didn't suffer because of Eccclestone's bribe, and that means that the case got thrown out. As F1Fanatic reports, Gerhard Gribkowsky stated that the bribe was a payoff, to keep him from trying to wrestle control of F1 away from Bernie. Bernie, however, states that the bribe was to keep Gribkowsky quiet about the intimate details of his perhaps-less-than-legal control of F1. F1Fanatic has an excellent explanation of the whole case, but these two lines from Bernie Ecclestone are particularly illuminating. "I made a payment to Dr Gribkowsky because he was shaking me down concerning some allegations that he could say to the [Inland] Revenue that I controlled our family trust, which would have been extremely expensive." "There was never a bribe," he added. "I made a payment to Gribkowsky for completely different reasons. I had no reason to bribe him. I paid him money not to do what he said that he could and was capable of doing, which was informing the English Revenue that I was running the trust." The best part of the case was that it revealed exactly how the bribery played out, which was not unlike a half-decent English crime movie. Ecclestone and Gribkowsky first started their talks in a motorhome at the 2006 Bahrain Grand Prix and went on at a restaurant called 'The Rib Room.' Here's a quote from Bribkowsky explaining what happened. "Mr Ecclestone commented this latter phrase with the words, 'Forget Stephen' and challenged me to 'tell me a number', whereupon I told him 50. To me it was clear that that meant $50 million. The conversation ended with Mr Ecclestone saying that he would think about it. Gribkowsky got $45 million but is now in jail allowed sometimes out of jail to consult for this Austrian firm, while Ecclestone walks free and Constantin Medien leaves the courtroom empty handed. How Bernie does it I do not know.